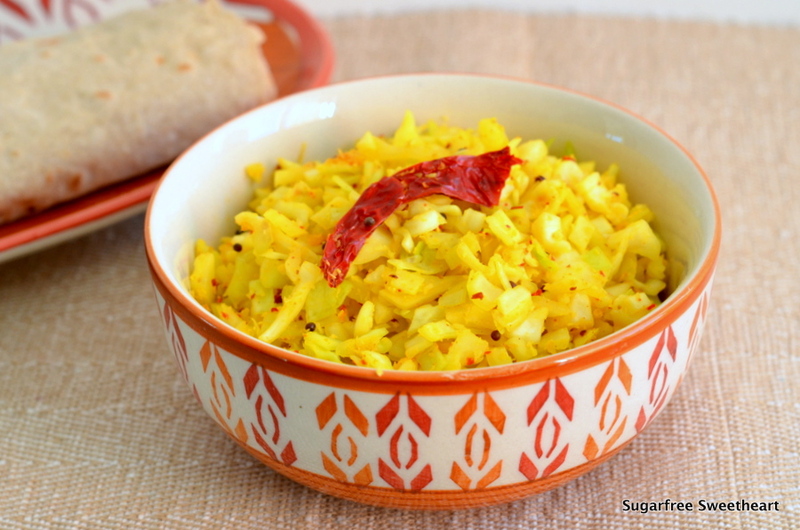 A common Kannadiga side dish, Cabbage Palya is a quick, and easy recipe. In this version, I’ve upped the crunch factor because, let’s face it, crunchy cabbage is way cooler than cooked cabbage! I’ve also slightly increased the oomph quotient by adding a little more mustard seeds and a little less coconut to the ground masala that is mixed in at the end. Usually Cabbage Palya is made by cooking the cabbage thoroughly so that it becomes soft, almost mush. But, as a side with rotis, the crunchier, and punchier version, I’ve shared below is a hit in my family. It even impressed my mother-in-law (yup, that good!). So this recipe is dedicated to her. Most of the ingredients for this simple recipe are readily available: cabbage, mustard seeds, urad dal (split black gram), and coconut (you can use unsweetened flakes too). The one ingredient that is uncommon is Byadgi chillies. These red chillies are used in ground masalas in Kannadiga cuisine because of their deep colour and warmth and reduced spiciness. You’re likely to find these at an Indian store (if you are outside India). However since you also get the super spicy Kashmiri dried chillies in Indian stores, be sure to check that the chillies are highly wrinkled in appearance—that’s the characteristic of Byadgi ones! Sometimes, you will find a couple of non Byadgi chillies lurking in a packet of Byadgi ones, so before you grind any masala with Byadgi chillies, do check for any suspect non-wrinkly, shiny chillies as these will tend make your masala extra spicy. Here’s a crash course on Byadgi identification! Now that you’ve got the Byadgi identification out of the way, let’s get to the recipe on hand. This recipe is suitable for diabetics, weight watchers, and cabbage stir-fry aficionados! Steaming the cabbage before stir frying it, is optional. I usually skip this step because I’m always trying for the crunchiest version I can make! 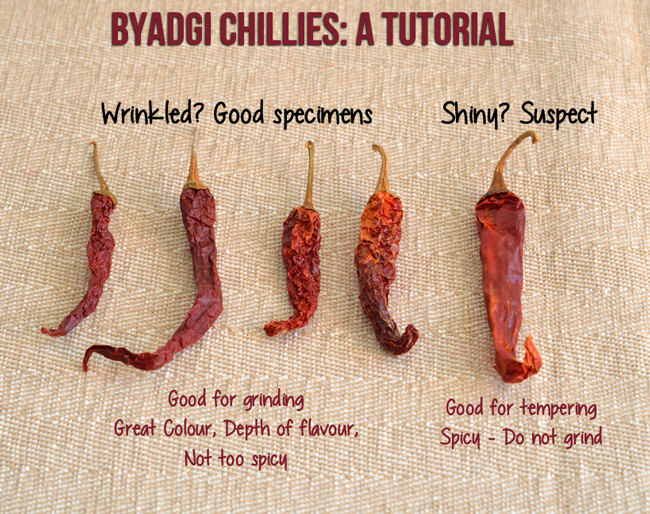 If you don’t have access to Byadgi chillies, feel free to use half or one regular dried chilli while grinding. If you don’t have access to any dried chillies, you can make this dish without chillies: the mustard seeds impart a little kick anyway! If you like the taste of coconut, feel free to add in more for the masala. It’s all good! Looks super delicious- spicier the better in my book! Also, the chilli tips are brilliant! I love the idea of combining these different textures! Thanks Afra! It’s one of my fav accompaniments to rotis. 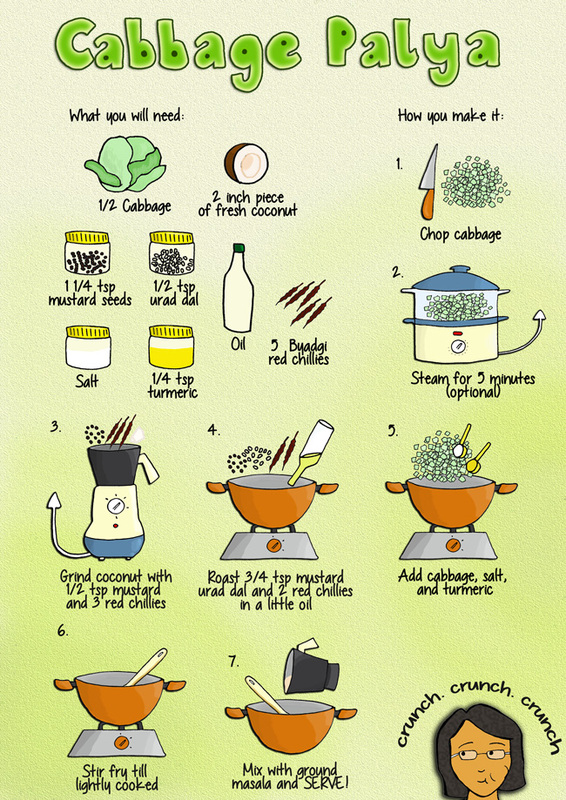 I love your illustration and the bowl in the pic..makes a simple cabbage stir fry so beautiful. Udipi brand “Byadigi” chilies is available in most Indian stores in the US..i like using that variety for the lovely color it imparts to dishes. I got the bowl from that store that I took you to in Mantri Mall. I so wish I could send you some without fear of them breaking in transit! Wow, this sounds so good. I’m going to bookmark it, to make soon. I love cabbage, coconut, and the mixture of spices.The byadgi chillies are interseting too. Mmmm. Thanks for sharing! Nice blend! That is a great tip for identifying byadgi chillies, thanks! Super delicious. I love cabbage in any form….definitely a keeper :).